The final motif is done. The horse is going up a hill. 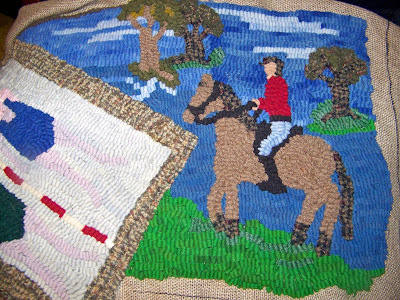 I didn't change the saddle and rider to western, but I did put the rider in jeans instead of formal breeches like the rider at the other end of the rug. My mother asked me yesterday what I planned to do with this rug, so for the first time I said that I wanted to put it over the opening between the dining room and the living room (I'm sure there's a name for that kind of architectural feature, but I don't know what it is.) My mother said she thought that was perfect - now I'll have to figure out which way to hang it. I guess there will be time to think about that while I hook the border - and then work once more around with the whipping. I guess I'm not nearly done yet. I love the random border. That is a great idea. Certainly adds more interest than straight lines. I am learning lots from your postings - like the term anti-godlin. I've never heard that before.